Just like my new EquiSafety Hi Vis Jacket, this is also a spontaneous sales purchase which I love! It is perfect for hacking on gloomy winter days and is so bright and reflective! This combined with Scottie’s natural ginger and my Hi Vis Jacket, we look like the sun glowing down the road! On a sunny day I think we must be blinding! I really like the design with the extra Hi Vis strips, pockets and the extra strap which can go round the chest for extra hi Vis. There are also lots of extra straps to help keep the rug secure on a breezy day. There is the fillet string strap, girth slots as well as lots of other attachments for possible straps. So lots of options to help keep it secure! However, I do find it a bit snug in places! Don’t get me wrong, it fits Scottie’s back and bum really well. But I’ve got a full size and the hole for the saddle is a bit too small. So to avoid having it tight over Scottie’s withers I have to tuck it under the back of our saddle and half pad, which isn’t ideal. But I think this issue is our saddle as I recently had the same issue with a waterproof sheet I used with our old saddle with no issues. Our new saddle is only a 17.5” and isn’t particularly bulky. So if you have a big saddle you might want to get a bigger size or just accept it will be tucked under your saddle! I have a similar issue with the adjustable chest strap… it’s too small for Scottie when it’s attached to the sheet. I haven’t tried it attached to the D rings on your saddle, which they also suggest doing with it as I don’t feel like we really need the extra hi vis. So it might fit okay there. But I feel it’s important to mention as Scottie is a TB and isn’t particularly chunky. So does seem a bit odd that the straps don’t fit him. 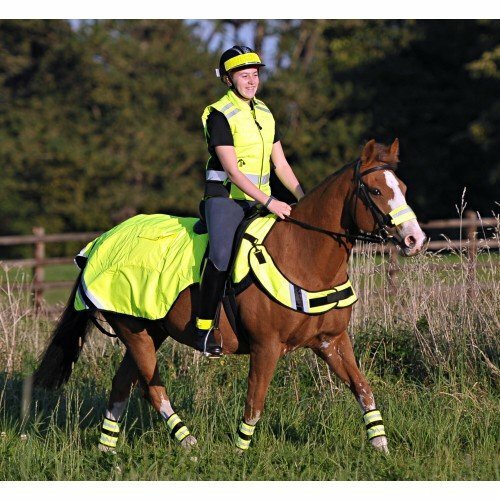 As with the jacket, it comes in pink, orange and yellow and comes in sizes from XXS Pony to X Full.